Women and children waiting in front of a health post in Kaga- Bandoro, north-western Central African Republic (CAR). 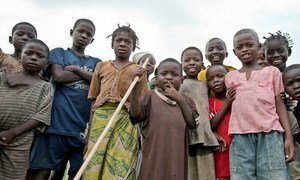 The United Nations Office for the Coordination of Humanitarian Affairs (OCHA) has condemned ‘in the strongest terms’ recent attacks involving humanitarian workers in the northern town of Kaga Bandoro located in the Nana Gribizi prefecture of the Central African Republic (CAR). “Violence against aid workers is a serious breach of International Humanitarian Law,” OCHA underscored in a news release issued yesterday. According to the release, during the month of September, some 15 attacks were recorded with instances where armed men broke into the premises of international organizations. Highlighting the negative impact of such violence, particularly on vulnerable populations that are still in dire need of humanitarian aid, OCHA deplored the deterioration in the protection of civilians’ the country. It added that the attacks come amid a situation when humanitarian funding for the African country is at its lowest. Condemning recent violence in Ndomete and Kaga Bandoro in Central African Republic (CAR), the United Nations Multidimensional Integrated Stabilization Mission in the country (MINUSCA) called on local communities to remain calm and underlined its right to take appropriate measures to prevent destabilization of the situation.